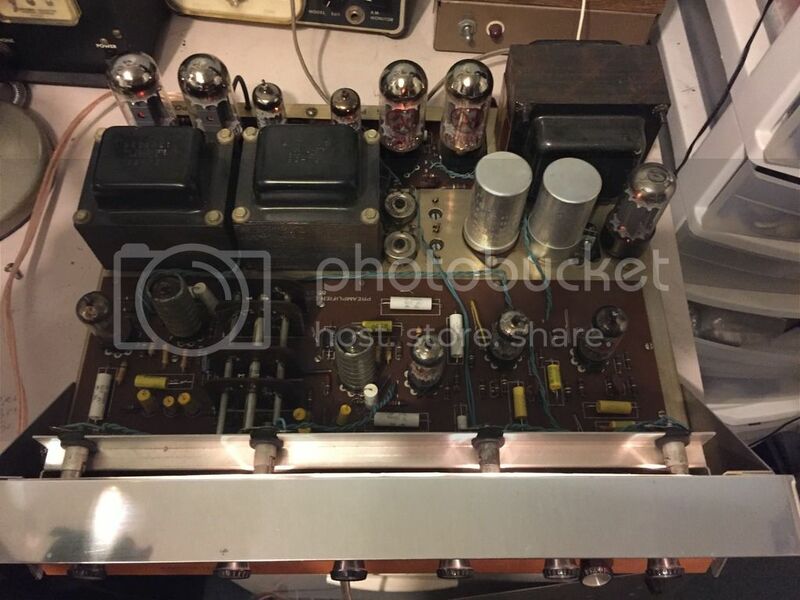 Home Theater Forum and Systems - HomeTheaterShack.com > HiFi Audio Components | Music > Two Channel Audio > Work in progress tube amp. Work in progress tube amp. So far it has all new tubes and caps. It also had few bad traces and cold solder joints on the circuit board. All the variable resisters and switches have been cleaned too. One mistake was using Russian made output tubes. They sound good, but are just a little taller than the original tubes. So the top of the case does not fit anymore. Honestly that does not bother me. I kinda like looking at glow of the tubes. I may never bother buying shorter tubes. 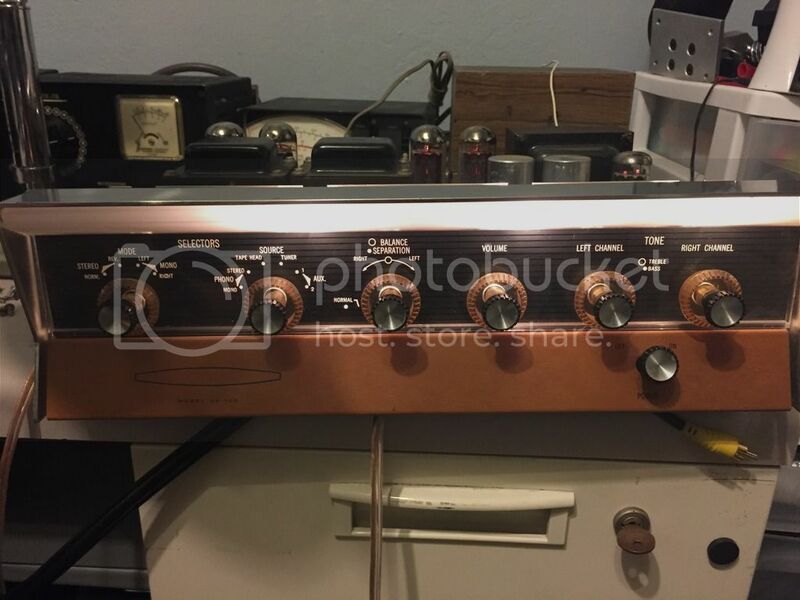 Here are a couple pics of the amp after some of the repairs were made. Still on the bench being tested. The front looks pretty good for it's age. New caps. Also check out the good size output transformers. The tall caps look original but they have been replaced, one is new and the other has been gutted and new caps installed inside it. 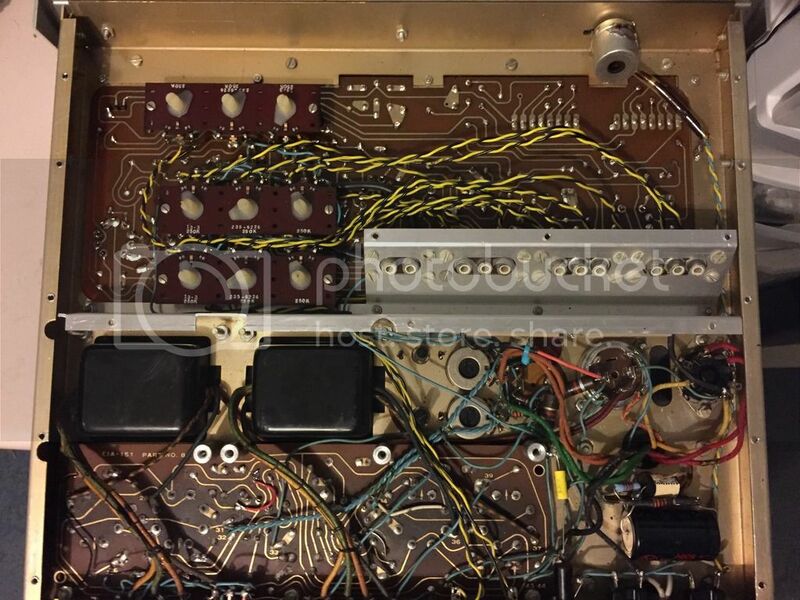 You can see where someone put short jumpers on bad traces on the circuit board. I am going to try and make it look a little cleaner. 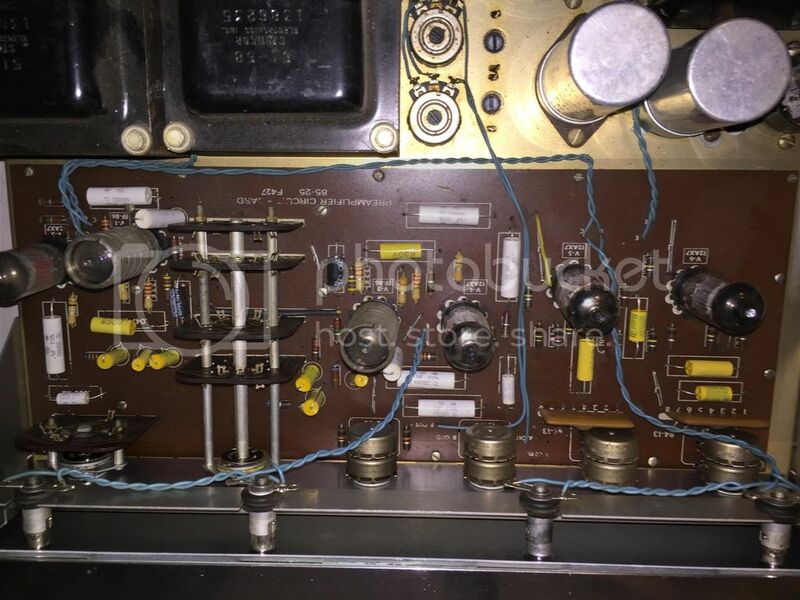 There is a repair tag sticker from Heathkit dated 1981 on the bottom cover of the amp. There is another sticker under the 1981 sticker but I cant read it. So this poor amp has been repaired at least a couple times before I got it. Re: Work in progress tube amp. Great job, Travis! Hopefully I will get a chance to hear it someday...it has been years since i have had any tube equipment. I do remember that cables and isolation made huge differences in the sound of the Audible Illusions preamp I used to have. Try some sorbothane pucks under it, and see if it makes any difference. I might still have some brass cones to let you try out too. I have some old Scott tube stuff.